It took many an email, copious notices snail-mailed home, and robo-calls aplenty, not to mention some thinly veiled threats of turning away unvaccinated kids from school. But education and health officials around Pennsylvania say that, for the most part, families appear to be rising to the challenge of earlier, stricter deadlines for getting students immunized. "At this time, school districts and school nurses are doing a great job of coordinating with parents and asking for resources when needed," said state health department spokeswoman April Hutcheson. No new immunization numbers have been tallied yet, but officials say the rules seem to be having the desired effect. Under new immunization rules, all Pennsylvania schoolchildren were supposed to show up on the first day of school having received all required vaccines, or face possibly being turned away. School officials were allowed to grant a five-day grace period for kids to get the needed shots, but that was far stricter than the old rule, which gave students eight months to get all mandated vaccines. Until now, Pennsylvania had one of the nation's most lax vaccine standards, leading state physician general Rachel Levine to campaign for the new rules. Health officials have warned that failure to vaccinate has led to outbreaks of dangerous disease, such as the numerous measles cases this year in a Somali immigrant community in Minnesota. The new state rules also require some additional vaccinations for polio and meningitis, in addition to those already required for tetanus, diphtheria, acellular pertussis, measles, mumps, rubella, hepatitis B and children pox. Students can get a reprieve if they come in with a plan from their doctor for when they will receive the needed immunizations, or if they have a medical condition or religious objection that precludes vaccinations. In some districts, such as Lancaster, there were more substantial numbers of unvaccinated children. Last week, a clinic held with the state's help in the city of Lancaster immunized more than 40 children, Hutcheson said. In this region, many districts said their staff worked during the summer to get the word out. Some districts, such as Abington, have held vaccination clinics to help their families, some before school started. Since school has opened, some districts have stepped up efforts so kids don't have to miss class. 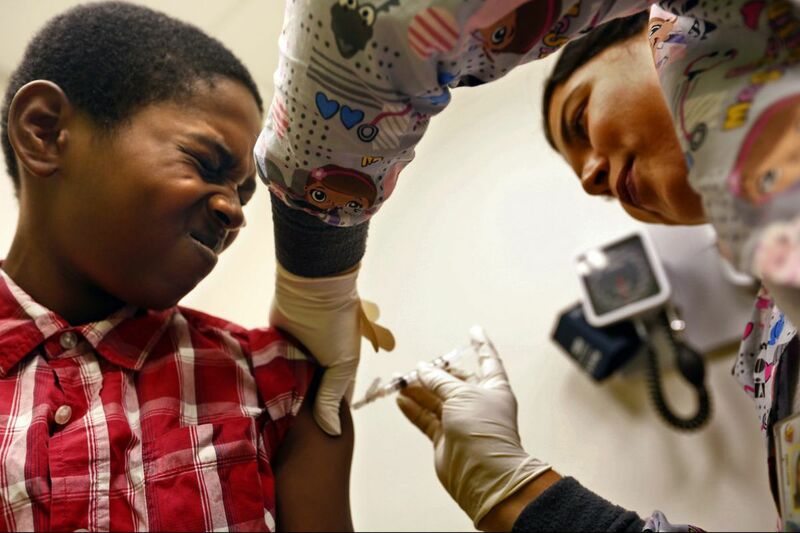 "We have made repeated efforts to contact all parents with the new vaccination requirements," said Patricia McGlone, spokeswoman of the Downingtown Area School District. "Our school nurses are working on a daily basis to contact those families with students not up to date to make sure they have a plan to get this done." On Thursday, the district will start excluding students who have no plan or proof of vaccination, McGlone said. In Lower Merion, two students were kept home Tuesday, but district spokesman Douglas Young said they were expected to be able to come to school Wednesday. In the Garnet Valley School District, three high school students were out of compliance Tuesday but had obtained the required paperwork before the end of the day, according to Superintendent Marc Bertrando. Similiarly, Radnor had one secondary-school student who was able to get the necessary papers to the school. Without such papers, that person would have been allowed to remain in school, but apart from other students, said Michael Petitti, district spokesman. Most district officials said they were trying to avoid having to send students home or keeping them from class. "The School District of Philadelphia is working with the city's Department of Public Health to help ensure all students are vaccinated so that they can be in school every day and on time," said Philadelphia district spokeswoman Megan Lello. "Attendance is key in making sure students learn how to read and prepare for college and career, which is why the district has teamed up with the Department of Public Health to connect families to accessible vaccines throughout the city." Even before this new initiative, the Philadelphia schools had a pretty good vaccination rate, as did Pennsylvania, for the most part. According to federal statistics, 92 percent of Philadelphia adolescents had at least one dose of the vaccine for diphtheria, whooping cough, and tetanus. Nearly 93 percent had at least one meningitis vaccination, and almost 81 percent of the teenagers had at least one dose of the human papillomavirus vaccine. "Our goal is to get as many children as possible in to see their pediatrician and continue to stay up to date on the full immunization schedule," said James Garrow, city health department spokesman. "The recent changes in Pennsylvania's requirements will only help that. The more children that are successfully immunized, the safer we all are." How to achieve that? Efforts like this help. In a review she wrote for the online Behavioral Scientist of what policies tended to deter people from seeking to exempt their kids from vaccines, Alison Buttenheim, associate director of the University of Pennsylvania's Center for Health Incentives and Behavioral Economics, put something she called "hassle factors" at the top of the list. An example of such a "hassle" was parents being required to confirm the risks of not vaccinating and acknowledging their children might be prohibited from attending school in the case of a disease outbreak.